On Sunday, June 21st, Madge from Wildlife Rescue Inc. visited us and brought some of her friends. Wildlife rescue’s main goal is to rehabilitate the animals and release them back into the wild. Unfortunately not all of the animals make a full recovery and are able to survive on their own. She brought three types of owls, all of which are blind in one eye and would not be able to hunt very well on their own. She brought a screech owl, a long horned owl, and a non native pygmy owl. Madge also brought two types of humming birds, one of which was a baby, and she had to feed it every 45 minuets. 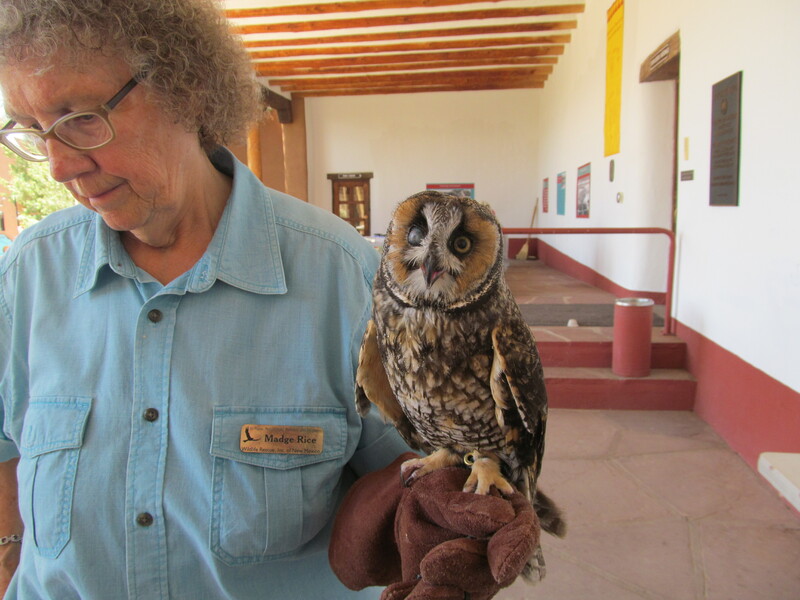 We learned a lot about birds and their environments from Madge, and we welcome her to join us at Coronado Historic Site any time! Tags: Albuquerque, Avian, Bernalillo, Bird Rescue, Birds, Coronado Historic Site, DCA, Environment, Event, Feathers, History, Hummingbird, Inc. of New Mexico, Kuaua, Kuaua Pueblo, Long Eared Owl, Native Animals, Native Birds, Nature, New Mexico, New Mexico Department of Cultural Affairs, Owls, Presentation, Pueblo, Ranger Ethan, Screech Owl, Southwest, Southwest Animals, Summer Activitiy, Summer Program, Western Screech Owl, Wildlife Rescue. Bookmark the permalink.